Washington-based boatyard Modutech Marine has commenced its rollout of 24 support tugs to the US Navy, the debut vessel having been delivered in December 2017. Built under the class handle of ‘Work Boat Medium’ and designed by fellow Washingtonian naval architect Hockema & Whalen and Associates, each tug in this series measures 9.14m x 4.57m and has been produced to draw 1.65m. 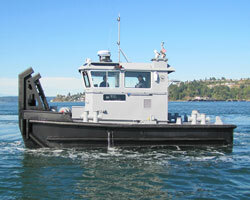 The US Navy expects to take delivery of all 24 tugs by December 2019. Design features include wide side decks, for enhanced personnel safety whilst working on deck. The deck is equipped with an 181kg davit, which can be moved to port or starboard mounts, and a pair of deck winches, located forward, starboard and port.